Two decades of research have led Dr. Seelig to find three things we can do to increase our chances of having good things happen to us. The first is to take small risks. When I got involved in sustainable agriculture, taking a small risk to steward rare breeds instead of conventional ones seemed a small chance with large rewards. Never would I have imagined I’d end up with a herd of Fell Ponies in the mountains of Colorado and friends worldwide who love them! I think of ‘taking small risks’ as poking the universe to see how it responds. Shortly after I bought my first Fell Ponies (before email and social media were prevalent) I sent a paper letter to a long time breeder in Cumbria, not knowing if I would hear back. Not only did I get a response, but that initial letter led to regular correspondence then more ‘penpals’ and eventually trips to Cumbria to visit the people I’d been corresponding with. That small risk of sending a letter definitely had long term ramifications, nearly all positive. The second thing Dr. Seelig recommends is to show appreciation. “When someone does something for you, they’re taking that time that they could be spending on themselves or someone else, and you need to acknowledge what they’re doing.” (2) I am grateful to my parents who were persistent in requiring a “thank you” whenever a courtesy was shown to me. I’ve been surprised how many people don’t practice that simple custom. I try to always give credit and express appreciation for all I learn about these ponies (as well as other things in life), and I have definitely benefited in ways I would never have imagined. The third thing Dr. Seelig recommends is to embrace crazy ideas. “Ideas that seem the craziest often have a seed of something powerful, and if you take a few minutes to think about how it might work, you open yourself up to really interesting possibilities.” (3) When I got involved in sustainable agriculture, using draft animal power was quite common in that community. But I had the crazy idea that using ponies made more sense. Talk about ‘really interesting possibilities’ opening up! The fact that the same animal can be used in harness, ridden, driving, and for packing is truly more sustainable than having different animals for different uses. I’ve never been sorry nor been tempted to get a bigger equine. While luck may not be random, it isn’t necessarily easy to cultivate, either. My mother, rest her soul, thought my change from a high tech career to one in agriculture and land stewardship was ill advised, and she reminded me of her opinion every time she talked to me (she grew up on a farm, so she spoke from first hand experience). Of course my mind was pretty good at amplifying that nay-saying from an important person in my life. It takes consistent effort to continue taking small risks, showing appreciation, and embracing crazy ideas. So while I’ll always wrestle with nay-sayers, including myself, there’s no question I’ll keep trying to cultivate luck. “Out of Luck? Try This,” Stanford Magazine, December 2018,p. 25. 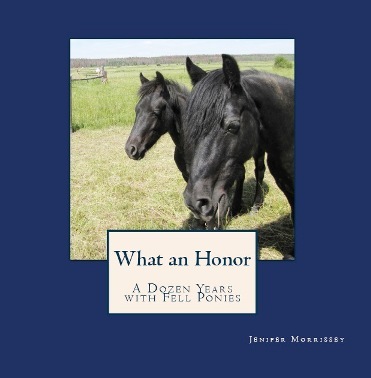 More stories like this one can be found in my books What an Honor: A Dozen Years with Fell Ponies and The Partnered Pony: What’s Possible, Practical, and Powerful with Small Equines, available internationally by clicking here or on the book covers.